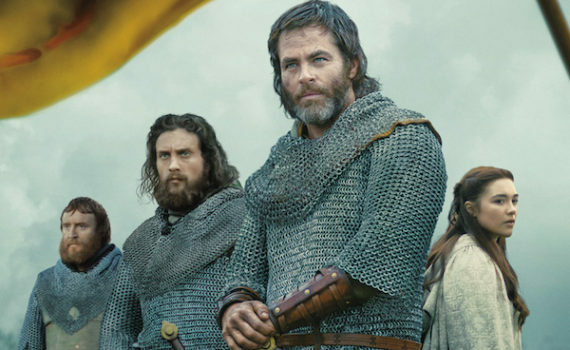 With a spectacular followup to Hell or High Water and an incredible tribute to Braveheart, Mackenzie and Pine team up once more to make Outlaw King one of the best films of the year, completely separate from its status as a Netflix original movie and completely shocking to those who did not see this war epic coming. Hell or High Water was one of my favorite films from 2016 and Braveheart is one of my favorite movies of all time, so I was fairly prepared for a stellar achievement, but even I wasn’t ready for the power of Outlaw King, or the originality of its delivery. Think the Scottish dramas you’ve seen before combined with the brutality of a slaughterhouse and you’ll have some idea what you’re in store for, and if that sounds like something you can appreciate/stomach, wow are you in for a treat. As William Wallace’s rebellion fails and the legendary hero goes into hiding, Robert Bruce makes peace with the English in order to save what’s left of Scotland. He and his nobles swear fealty, bend down, but haven’t forgotten, they’re only making the best decision they can with the threat of total annihilation hanging over their heads. Robert will soon be King if he keeps his nose clean, but the death of Wallace sends a shock wave through the countryside, and the Scots are ready to fight again, though they remain exhausted from years of war. So Bruce rallies his troops for another open rebellion, but without Wallace the Highlanders don’t come running down from the hills, and a quick death seems Robert’s fated end. Only fast thinking and sheer, God-granted luck will keep him alive to see his nation free, though many a gruesome battle stands between the dream of independence and its fulfillment. Mackenzie can direct anything, apparently, from a Neo-Western morality piece to a historic drama that we all thought we’d seen before. Guess what; we hadn’t, Outlaw King tells another story, and although you’ll recollect some Braveheart if you’re a fan, this is the continuation of that tale, not a recycling. Chris Pine takes a slightly different approach as well, playing his character with less accent and more introspection, allowing us to feel Bruce and his pain from start to finish. But, as much as I loved Pine in this role, there are two men who have him outmatched here, and I am still shocked to be saying that. Billy Howle (On Chesil Beach) as Prince Edward was something special, but Aaron Taylor-Johnson (Godzilla) as Black Douglas was something else entirely, a once-in-a-lifetime performance that should define his career. So, Pine hasn’t been better since Z for Zachariah, Pugh continues past Lady Macbeth with another strong showing, and the film presents some amazing, dark cinematography to enjoy if what you want with your bleak picture is more bleakness. More brutal than you were prepared for, more accurate than its predecessors, more moving than I expected; Outlaw King is one of the best 2018 has to offer.